A London-based startup has combined some of today’s most disruptive technologies in a bid to change the way we’ll build the future. By retrofitting industrial robots with 3D printing guns and artificial intelligence algorithms, Ai Build has constructed machines that can see, create, and even learn from their mistakes. “We wanted to push the boundaries of how intricate we could design things through computation and how we could create them through 3D printing,” Cam said. 3D printing may be seen as the future of fabrication but it can be an expensive, time-consuming, and unscalable endeavor. Small objects are simple enough to print. Larger objects can often be prohibitively complicated. When you read about fully 3D printed airplanes, office spaces, or artworks, they’re not printed as a whole, but rather as many small parts that are pieced together afterward like a puzzle. To scale up the printing process, Cam and his team strapped foam guns to KUKA robotic arms and programmed them to print intricate structures. 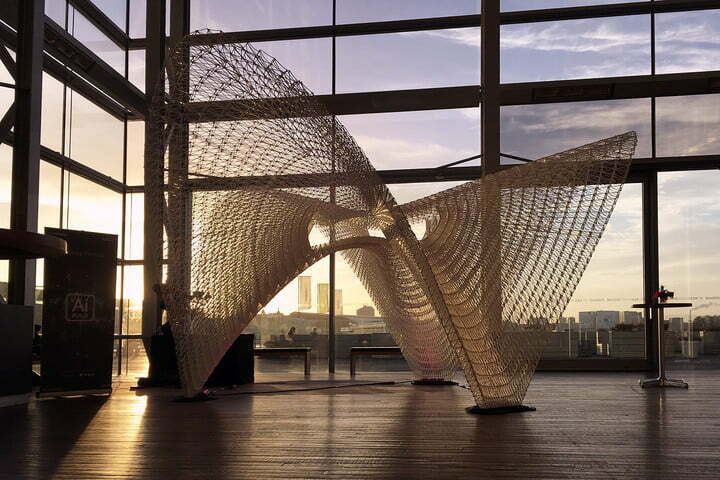 To cut costs and expedite construction, they combined the standard layer-by-layer design with a latticework design that printed filament at angles while small fans simultaneously cooled and hardened the material. This allowed them to use a lot less material while still supporting strong and efficient structures. But it was still too slow. Fabrication leaves little room for error, so the robots had to print at a snail’s pace, excreting filament precisely and uniformly, then waiting for it to dry. If Ai Build wanted quicker — and thus cheaper — printing, it would either risk structural defects or have to overcome a fundamental flaw in robotics. A London-based startup has combined some of today’s most disruptive technologies in a bid to change the way we’ll build the future. By retrofitting industrial robots with 3D printing guns and artificial intelligence algorithms, Ai Build has constructed machines that can see, create, and even learn from their mistakes.When CEO and founder Daghan Cam was studying architecture, he noticed a disconnect between small-scale manufacturing and large-scale construction. “On one side we have a fully automated production pipeline,” Cam explained at a recent conference in London. “On the other side we’re completely dependent on human labor.” With the emergence of more efficient printing technologies, he thought there must be a better way.“We wanted to push the boundaries of how intricate we could design things through computation and how we could create them through 3D printing,” Cam said. To solve this problem, Cam and his team attached cameras to their robots and used machine vision algorithms to analyze the structures as they were being printed. “The goal was to create a feedback loop between the physical environment and the digital environment,” Cam said. With its new set of eyes, the robotic arm could detect defects and compensate for them in subsequent layers. The results were quickly printed, Zaha Hadid-esque structures that Cam says were printed in about half the time it would take without the AI. Ai Build’s first stand out structure was printed for just $185 — a fraction of the $31,000 Cam said competitor quoted to print a structure with the same specifications. Not only did the competitors lack AI, they would also need to print the piece in multiple parts. The ability to print structures as a single, complete unit gives Ai Build an undeniable edge. But the startup has limits to scale. 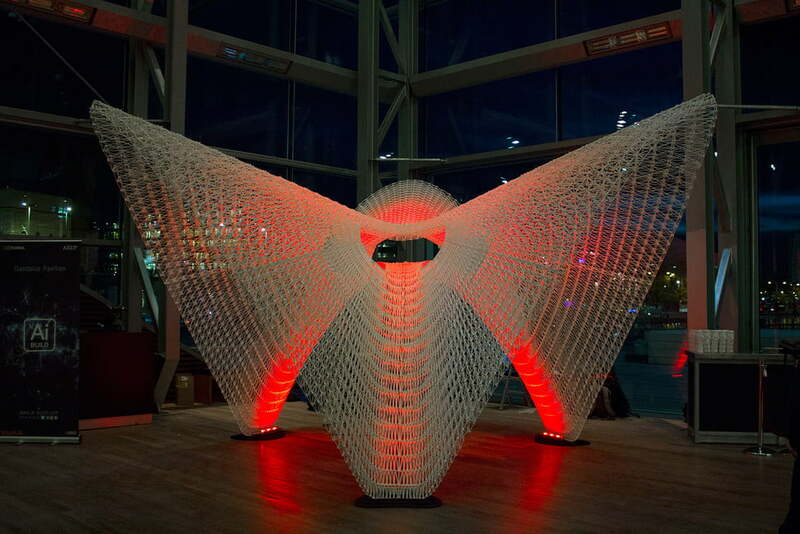 Just last week at GPU Technology Conference in Amsterdam, they premiered a five meter wide, five meter deep, four and one-half meter tall structure designed in partnership with renowned firm Arup Engineers. Dubbed the “Daedalus Pavilion” after the legendary craftsmen who built the Labyrinth, the 350-pound pavilion consists of 48 individual parts. Despite its impressive size, it took just fifteen days to print and a half-day to construct. Given the company’s rate of about $100 per robot hour, an object of this size would cost a little over $35,600. “The structure was quiet optimized for using material efficiently and to minimize production time so the whole structure was very lightweight in the end,” Cam said. The project saw the young company continue its partnerships with GPU-manufacturer NVIDIA and robotics-manufacturer KUKA, two established firms at the top of their respective industries. Beautiful as it may be, the Daedalus Pavilion is just a proof of concept. And though the startup has an obvious interest in design, it’s focus is on revolutionizing large-scale construction with 3D-printed structures such as concrete casting molds. Ai Build has also begun early development of a futuristic chandelier called aiPort, which is designed to integrate all smart devices into a single place. With a series of gestures or words, users can turn on a light bulb, turn down the air conditioning, and turn up the music on their stereo thanks to a panel of cameras and microphones sprawled across the chandelier. It’s like Tony Stark’s Jarvis for the upper middle class. Cam stresses that aiPort is still a prototype though, placed on the back burner while his company tends to the 3D printing project. Many of today’s startups take an emerging technology and adapt it for an age old industry. AI is present from the backend of finance to the front end of healthcare. Robots now replace receptionists, foods runners, and factory workers around the world. Cam and his team have instead recognized a flaw in construction and combined three emerging technologies to address it in an efficient way. The technologies they use aren’t particularly innovative in their own right, but when used in conjunction with one another, they have the potential to revolutionize the construction industry.